VeryPDF PDF to Table Extractor is designed to extract PDF table data to Microsoft Office Excel and CSV files. It supports Excel (.xls) and comma-separated value (.csv) files. Users can manually divide the table columns and then save the data to an Excel or CSV file. With this application, you need not copy and paste to import valuable data from PDF table files. Export PDF table to Excel. VeryPDF PDF to Table Extractor can export table data to Microsoft Excel files. With this feature, users can easily import PDF data and text of, such as statistical forms, to Microsoft Excel and use them in the future. Export PDF table to CSV. VeryPDF PDF to Table Extractor supports an output format of CSV (comma-separated value). You can use this application to export PDF files, for example, address books, to CSV files. Because CSV format is accepted by most contact managing applications, you can use this feature to import contacts in PDF. Manually divide table columns. 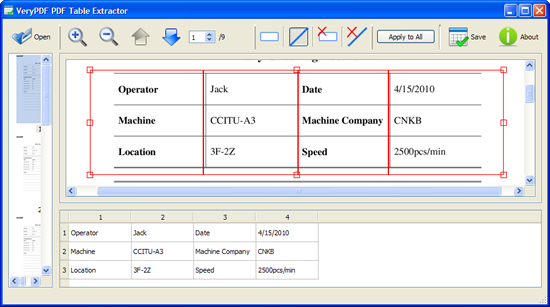 VeryPDF PDF to Table Extractor provides a tool to divide table columns manually. The divided text in separated columns will be exported to corresponding Excel sheet columns. With this feature, you may control which text to be which columns. Convert PDF to Excel - Liberate your data. Select data in PDF then export into spreadsheet. Convert PDF documents into structured data. Extract Tables From PDF. Stuck with PDF files containing tabular data you would rather see in Excel or your BI system? Use PDF to Table Extractor to turn tables from PDF to Excel files. Parse Sales Leads and Contact Inquiries. Are you receiving sales leads and contact inquiries from third party lead providers as PDF files? With PDF to Table Extractor you can easily transform those documents into new records in your CRM or Marketing Automation platform. Process Recurring Invoices. Getting billed by the same vendor on a regular basis? PDF to Table Extractor makes it easy to pull relevant data from recurring invoices such as the invoice reference, the date, totals and line items. Parse Travel Itineraries. Do you need to centralize travel activities of your team or clients? With PDF to Table Extractor you can extract travel itinerary information and parse PDF booking confirmations. Parse Reports. Are you receiving reports in PDF format on a regular basis but would rather have the data as a spreadsheet? Once set up, PDF to Table Extractor converts your PDF and gives you easy-to-handle structured data in return. Export your parsed data. You can download your parsed document data in various file formats. PDF to Table Extractor lets you convert PDF to Excel, CSV, JSON and XML files. Accurately convert PDF tables to Excel. This entry was posted in Table Extractor OCR and tagged extract table from pdf, pdf to csv, PDF to Excel, pdf to table. Bookmark the permalink.